The new superintendent of Petrified Forest National Park in Arizona, is concerned about potential conflicts between preservation of park values and mining for potash outside the park lands. Meanwhile, one of the major potash exploration companies released drill core information that confirms early unverified potash thicknesses and concentrations. PFNP Superintendent Brad Travers is quoted in the Arizona Journal newspaper that "This park has primarily a scientific story to tell, and our mission is to produce good science." 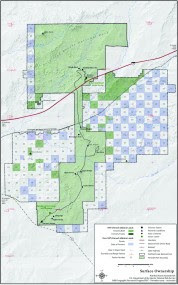 At the same time, Passport Potash announced preliminary results from two core holes that intersected potash deposits at relatively shallow depths in the Holbrook evaporite basin. According to chemical assay results obtained from Skyline Laboratories in Tucson, Arizona, Passport reports values of KCl ranging from 11.93% to 24.34%. These are generally comparable to the amounts reported from the first exploration drilling into the deposit in the 1960s and 70s. AZGS used average potash concentrations of 6% and 20% to calculate resources in our 2008 report. By sheer coincidence Petrified Forest National Park (PFNP) sits smack dab on top of the thickest potash deposit in the Holbrook basin. The concentration of petrified wood and the collecting areas of vertebrate fossils are definitely worthy of protection. Because this is one of the largest, potentially most valuable potash resources in the U.S., the State of Arizona and the U.S. would definitely benefit from its use. PFNP can protect resources within its boundary, but not on adjacent lands, about half of which are privately owned and half are State Trust Land. Most all of the adjacent land has already been leased for potash exploration. If a determination is made that potash can be mined economically, the value of the adjacent land will increase so much that purchase of it would be cost prohibitive, even if owners of the mineral rights were willing to sell. Under these circumstances PFNP has little hope of expanding and the thickest potash deposits beneath the PFNP will be locked in place forever. No doubt a lot of people don't care whether the potash is not mined. Likewise, a lot probably don't care whether PFNP expands its boundaries. To me, this is not a mutually exclusive situation and both could happen. I appreciate the scarcity and value of the petrified wood, archaeologic sites, vertebrate fossils, and the potash deposit as well. Seems to me that there is a real opportunity to be creative and make the PFNP/Holbrook Basin into a truly cooperative project where all parties benefit. Might mining the thickest phosphate (more than 1000 feet beneath PFNP) by entering from land adjacent to PFNP be considered in exchange for expanding boundaries of the park? Is this even practical? Could royalty from potash mined beneath PFNP be used to support operation of the Park? If so, PFNP could expand and maintain itself without requiring any tax dollars in this time of serious revenue shortage. In addition, more rare vertebrate fossils could be discovered and preserved. Would there be enough revenue to establish an outstanding museum in which to display these Arizona treasures? As part of the collaborative process, PFNP, the State Land Department, mineral lease holders, and private land owners would need to get together, give and take, and thrash out all the details. Could exchange of State Trust Lands in any way facilitate such a cooperative venture? I think it's worthy of consideration. In fairness, I must disclose that I purchased Passport stock a couple days ago. I have no connection to Passport or any of the other exploration companies. Seems to me that the companies involved can either go it on their own or can enter into some kind of cooperative venture with PFNP, private land owners, and the State Land Department. I much prefer to see a cooperative effort. Salazar to throw new hurdles at mining? Mineral Museum advocates "lawyering up"